We recently helped the New Zealand Nurses’ Organisation improve the user interface of its website. The New Zealand Nurses’ Organisation (NZNO) is a professional organisation and registered union representing over 46,000 nurses and health workers. 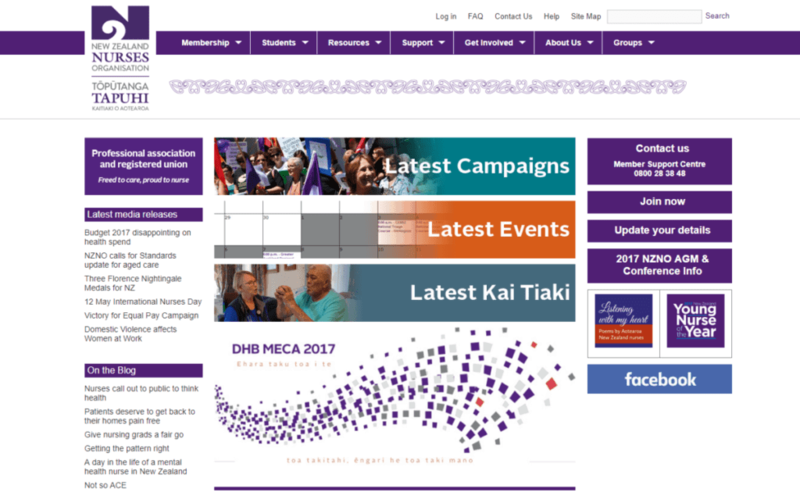 NZNO is a busy organisation with many subgroups and lots of campaigns on the go, and its website is an important tool in keeping members and potential members engaged and up to date. NZNO’s website runs on the DNN (DotNetNuke) content management system. Webstruxure provides service, support, hosting, and help and advice with website improvements. Recently, we upgraded the NZNO website from DNN 5 to DNN 6 and at the same time implemented a series of usability improvements. The usability improvements were guided by a website survey conducted by NZNO in April 2013. The survey showed that users were generally satisfied with the site as a whole, but that they had difficulty with complex navigation, the usability of search results, and the ability to find high-use information such as workplace and industrial resources. Based on these survey results, the home page and site navigation were redesigned to improve the user experience, and Webstruxure implemented the changes. These improvements included the replacement of the previous complex three-level navigation structure with a megamenu, improvements to the display of search results, changes to the home page to remove unneeded welcome text and an outdated tag cloud, and improved cues to show the user their location within the site – such as more prominent breadcrumbs. We’re continuing to work with NZNO on improvements to their site, with the focus now going on providing better and more consistent access to information for members of the 20 Colleges and Sections which represent specialties within the wider field of nursing.